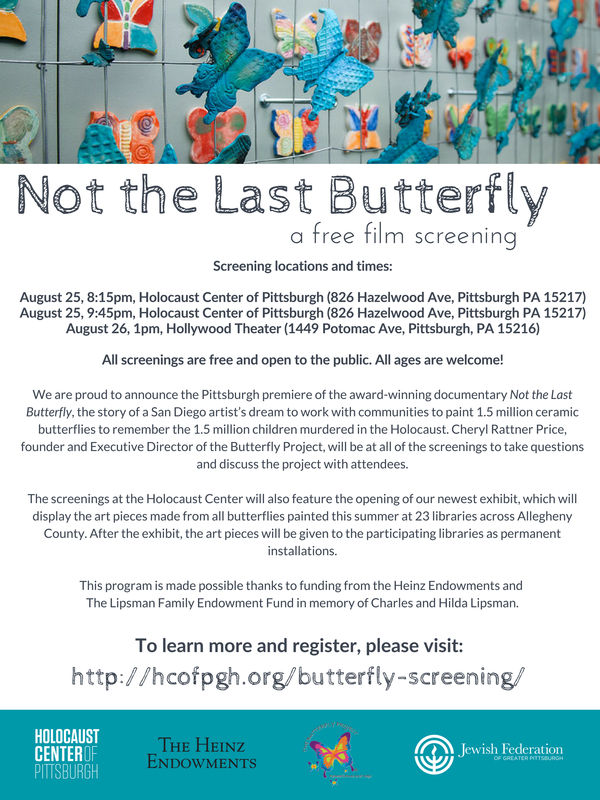 We are proud to announce the Pittsburgh premiere of the award-winning documentary Not the Last Butterfly, the story of a San Diego artist’s dream to work with communities to paint 1.5 million ceramic butterflies to remember the 1.5 million children murdered in the Holocaust. There will be three screenings: Two on August 25 at 8:15 p.m. and 9:45 p.m. at The Holocaust Center (826 Hazelwood Avenue, Pittsburgh, PA 15217), and one on August 26th at 1 p.m. at The Hollywood Theater (1449 Potomac Road, Dormont, PA, 15216). Cheryl Rattner Price, founder and Executive Director of the Butterfly Project, will be visiting from California and on site at all of the screenings to discuss the project and documentary with attendees. The screenings at the Center will also feature the opening of our newest exhibit, which will display the art pieces made from all butterflies painted this summer at 23 libraries across Allegheny County. After the exhibit, the art pieces will be given to the participating libraries as permanent installations. NOT The Last Butterfly is the award-winning documentary film about The Butterfly Project, a non-profit organization who uses lessons of the Holocaust to educate about the dangers of hatred and bigotry through the painting of ceramic butterflies, permanently displayed around the world to memorialize each of the 1.5 million children who perished in the Holocaust. Paired with a meaningful lesson in history, handmade ceramic butterflies are counted collectively to reach our goal of 1.5 million butterflies displayed around the world, a global memorial symbolizing renewed life. This summer, the Holocaust Center of Pittsburgh partnered with the Allegheny County Library Association to offer painting sessions for the Butterfly Project at libraries around the county. The Holocaust Center is proud to be bringing Cheryl Rattner Price, Co-Founder and Executive Director of The Butterfly Project, to Pittsburgh to attend all screenings. Cheryl will discuss the project and documentary with attendees after the screening. This program is made possible thanks to funding from the Heinz Endowments and The Lipsman Family Endowment Fund in memory of Charles and Hilda Lipsman.